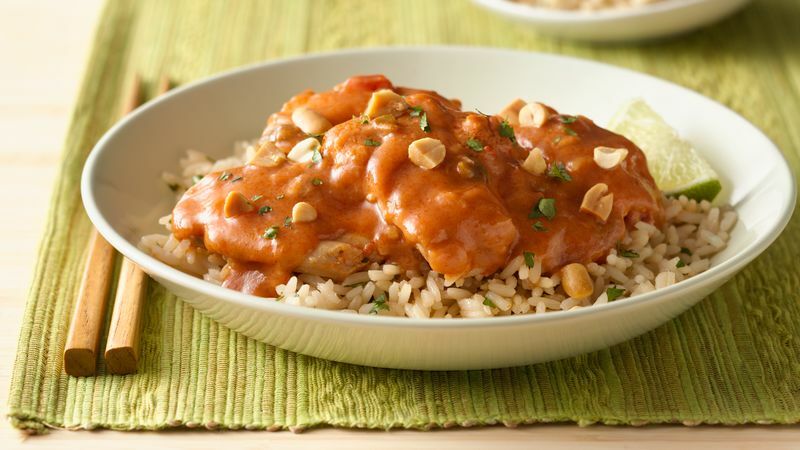 Place chicken in 3 1/2- to 6-quart slow cooker. Mix remaining ingredients except peanuts and cilantro; pour over chicken. Cover and cook on low heat setting 8 to 9 hours or until juice of chicken is no longer pink when centers of thickest pieces are cut. Remove chicken from cooker, using slotted spoon; place on serving platter. Remove sauce from slow cooker; skim fat from sauce. Pour sauce over chicken. Sprinkle with peanuts and cilantro. Note: This recipe was tested in slow cookers with heating elements in the side and bottom of the cooker, not in cookers that stand only on a heated base. For slow cookers with just a heated base, follow the manufacturer’s directions for layering ingredients and choosing a temperature. Complement this dish by serving it with rice that has been cooked in canned coconut milk instead of water. The coconut rice is especially good when you use the hot salsa in the chicken. Add a side of cucumber vinaigrette, and you'll have a wonderful blend of flavors and textures. The flavors of peanut butter, tomato and hot chilies are a popular Thai combination. We took a shortcut and used a purchased hot salsa for the tomatoes and chilies. If you prefer a dish with a little less kick, use a milder salsa. You'll still have a tasty dish. Have that bottle of fish sauce on your shelf since the last time you cooked Thai? You can replace the soy sauce in this recipe with fish sauce for a more authentic Thai flavor. If you would like to try fish sauce for the first time, look for it at an Asian-foods market or a large supermarket. It is made from salted fermented fish, is salty like soy sauce and has a pungent, strong fish flavor.